Rankwatch team on Facebook or Twitter. You have been writing brilliant content that is optimized with on-page, off-page, and technical SEO. Your content is ranking well and is being shared across various social media platforms. This happens, but not every time. Almost all businesses, be it large or small, invest a certain part of their budget in content promotion to gain visibility and drive a significant amount of traffic towards it. Businesses generally rely on paid promotion when their content -even if it has been well-optimized to rank on top- doesn’t get the traction that they expected it to generate. Although, when a site’s content get the expected traction, they still confide in paid content promotion to reach a wider audience. But how should you decide which platforms can be used to effectively run a paid content promotion, so that your goals are easily achieved, and your content has a lasting impact on the audience? In this article, we will talk about the factors based on which you can formulate a better decision about the platform that you should choose for paid content promotion. 1. Which Platform Has The Widest Reach? When you are looking forward to promoting your content, you need to start analyzing the reach of every single one of the platform that people use the most. 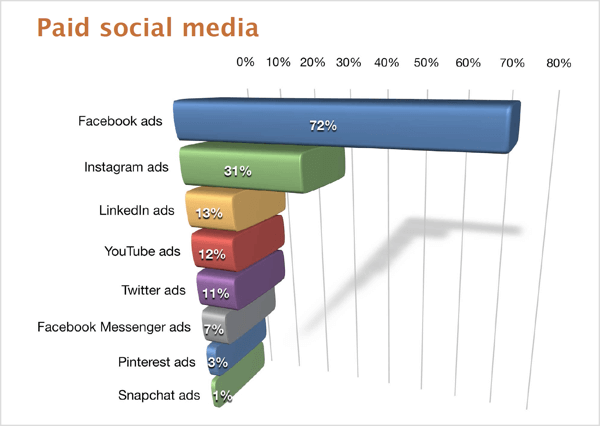 To help you better here are the stats accounting the reach of top 5 social media platforms. Facebook is leading in terms of reach because of the 2 Billion monthly active users. So, if you run advertisements on this platform there’s a possibility that you will reach a far wider audience than the other platforms. 2. Which Platform Does Your Audience Use? The content you’ve created must be targeting a particular gender, location, or age group. So now, you need to check the demographics of each platform to analyze which of them target the audience that is similar to whom your content is targetting. More than 50% of views come from mobile. If your content targets the women genders of the society then you should do paid promotions on social platforms like Facebook and Instagram. And if you are targetting a younger age group then the most appropriate platforms for content promotion would be Instagram, Facebook, and YouTube. 3. Which Platform Has The Highest Engagement Rate? You have to now analyze which of the platforms have the highest engagement rate, based on the nature of your content and the industry it is based upon, you need to decide which platforms increase your chances of engaging with the audience. In this category, however, we will study just 3 social media platforms because of their higher engagement rate. RivalIQ conducted a study to determine the social media platform that has the highest engagement rate amongst Facebook, Twitter, and Instagram in 6 industries. You are perfectly aware of the focused industry and the related audience that your content is targeting. And when you see the stats, it is clearly visible that Instagram has the highest engagement rate per post. So, no matter which industry’s audience your content is targeting, advertising on Instagram can bring you the most engagement. 4. Which Platform Has The Highest Conversion Rate? If you are aiming to build leads through your content, then you need to focus all your advertising efforts on the social platform that has a thriving conversion rate. A study by Heap suggested that (keeping aside the search engines: Google & Bing) Facebook Ads have the highest conversion rate (4.7%) followed by Instagram (3.1%). So, if you wish to increase the conversions using your content then you should go for paid promotions on Facebook. 5. Which Platform Has The Most Influencers? Paid Content Promotion on social channels does not limit to just the advertisements, influencers are also part of it as well. You can undoubtedly run ads but you can also partner with influencers to promote your content. Instagram and Facebook are the leading platforms that are considered to be the most important social media platforms for an influencer marketing strategy. You can partner with influencers and market your business or content. Although major influencers might demand a higher price, you surely have micro-influencers to fulfill content promotion. The reason why you should go for Influencers over ads is the audience can relate to the influencers and they trust them. If an influencer recommends your content or your site, then your traffic and conversions will eventually increase. 6. Which Platform Is Best For What Type Of Content? There are several types of content and numerous platform to do paid promotion on. So, you need to opt for the appropriate platform that is better than others for your chosen type of content. Facebook is one such platform that has the best of all of the other social platforms. You can share text, image, video, and links on Facebook. Similar to Facebook, Twitter also deals in texts, images, videos, and links but the text is limited to just 280 characters, whereas Facebook apparently has no character limit. Other than that, Instagram is solely a visual content sharing platform (images, videos, infographics) and YouTube is all about videos. You just need to choose the social platform and the type of content that works best on that particular platform. So, your paid content promotion delivers better results. 7. Which Platform Has Numerous Customization Options? Every social media platform has their separate Ads section. There is Facebook Ads, Instagram For Business, Twitter Ads, YouTube Advertising, and LinkedIn Ads. However, there are two major social media platforms that have numerous customization options to target their ads to a more specific audience: Facebook and Instagram. Facebook Ads offer you more targeting options than other social media platforms. You can target your Facebook Ads based on location, age, gender, interests, behaviour, and connections. You can target the audience that is already aware of your business. Facebook Ads allows you to specifically target the audience which has engaged with any form of your previously posted content. Facebook Ads identifies new audiences with interests that are similar to your best customers and targets your ads towards them, eventually building more links. This feature saves your money. If your ads are competing against each other by targeting a similar audience, Facebook steps in and runs the Ad that is performing well. Facebook Ads allow you to run ads based on its objective. Is it for brand awareness? Consideration? Or product conversion? Whatever your goal is, Facebook can run ads accordingly. 8. Which Platform Is The Most Cost-effective? When you invest in paid content promotion, you have to decide which of the platforms can get you the best results: the most traffic, conversions, engagement, reach, etc. at a reasonable price. However, if you look at the cost and services of every platform then you are surely going to find Facebook to be the most cost-effective platform. And it’s not just me who would prioritize for Facebook advertisements. It is 72% of the marketers as well. The reason why I would choose Facebook is clearly visible in this article. You might also be convinced by the end that Facebook seemed to be the most feasible social platform to run a paid content promotion on. Facebook has the widest reach, it has more customization options, most influencers are using Facebook; it caters to every form or content, even the conversion rate is higher of Facebook Ads. Plus, it is cost-effective. These are enough reasons that may compel any marketer to use Facebook as a medium for paid content promotion. But if you have more money to invest in such a form of promotion, you should prioritize Instagram next. You can control the ads (their customization and everything) through Facebook Ads easily and run paid promotion on both the platforms in a single go. However, if you still sceptical about what social media platform to choose for paid content promotion, this article answers all those questions that can help you take a better decision based on your specific goals. If you still have any query, the comments section is open to all.